WEEK 1 / 8 DURATIONAL PERFORMANCES IN A POSSIBLE ISLAND ? The conversation surrounding the ideas of A Possible Island ? center of the idea of an escape. 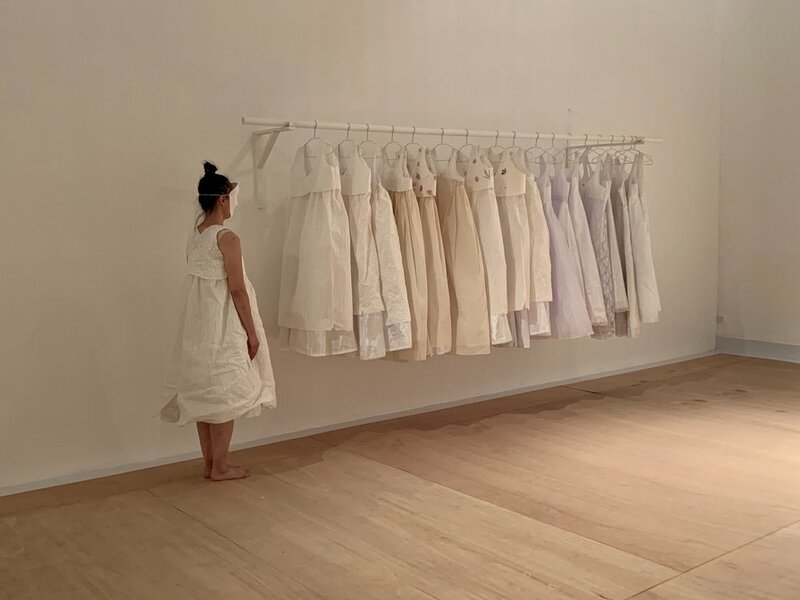 A Possible Island takes place in the mix off bustling malls and shopping centers, at the Bangkok Art and Cultural Center (BACC), where one walks through thick, hot, humid streets, into a crisply refrigerated building decorated with coffee shops, craftsman stands, and galleries. It’s unusual to find 8 artists, performing for three weeks on the 8th floor on this building. 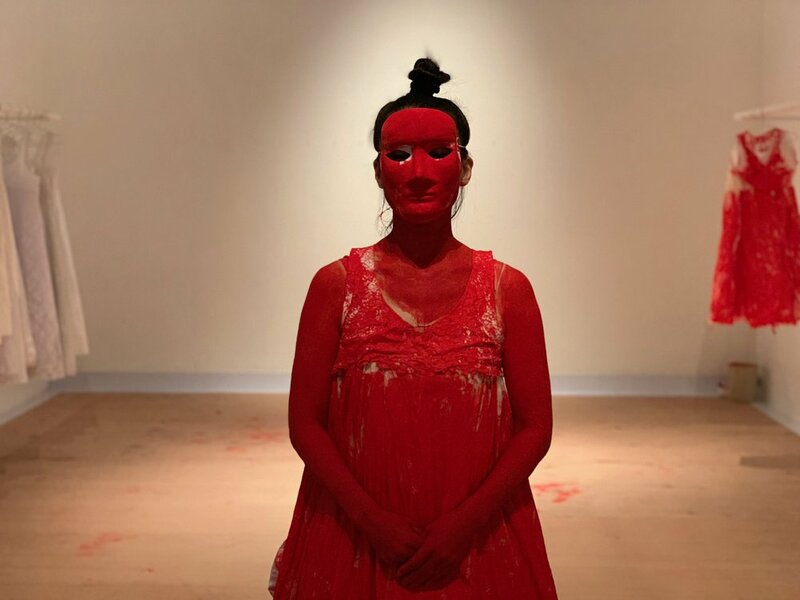 For three weeks, they present a space for the understanding hues of emotion, social and political boundaries, and human relations. There is no knowing, if this island is even possible. Pantea presents a game of the matador and the bull, seen mainly Spanish and Portuguese cultures. The setting is simple and she invites the visitors to enter a ring with her. Through a dance, she constantly oscillates between which part she plays — the antagonized and the aggressor. The audience varies: they try to help her, they play with her, they simply look at her from the outside. On the daily, Taweesak Molsawat walks from his home for nearly 21 kilometers (a 4-6 hour walk), to the BACC. He carries a box of fake flowers, and Facebook live streams the walk on a phone hung around his neck. Molsawat enacts a fictionalized ritual of daily life. It is mundane and his walk perhaps camouflages into the streets of Bangkok, but his arrival draws the attention of all the visitors. In the exhibition space, he celebrates the false life of his flowers. In a sterile, hospital like space, Yiannis Pappas considers the pains of self healing. He subscribes to the terms from Apollos to Telephus, “Only he who inflicts the wound can cure it.” Pappas molds parts of his body, waits for it to dry, and then releases himself. With time, the imagined healing is an entrapment, a demonstration of independence at an individual level, and dependency on the collective human. There is always a queue at entrance of Despina Zacharopoulou’s enclosed room. 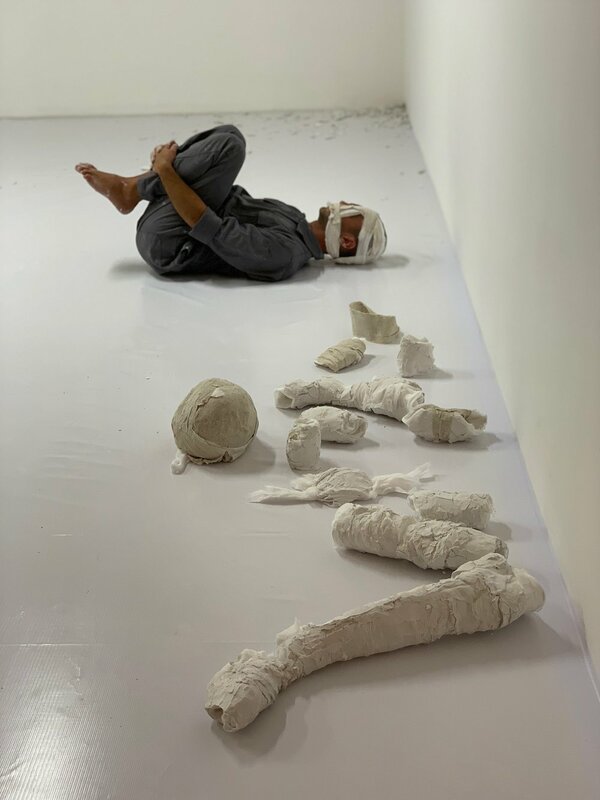 The artist asks all participants to sign a contract with the terms of her space, and wear latex gloves before entering. 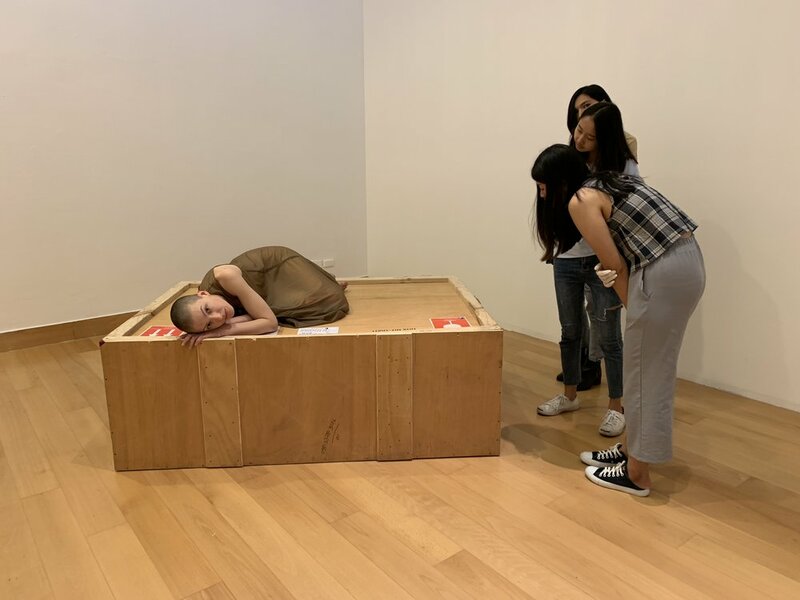 Within it, is an intimate room with Zacharopoulou on a crate. She appears as a human. Visitors walk around her, observe her (sometimes as an object on display), and considers an act - to touch her. Watching the whispers of a candle, Vandana is citing meditative Hindu scriptures. She moves towards the candles, circles around the candle, sits in front of the candle. The public is invited to join her in a seat within the corner of her eye. There is something solemn, humble and spiritual in this act. 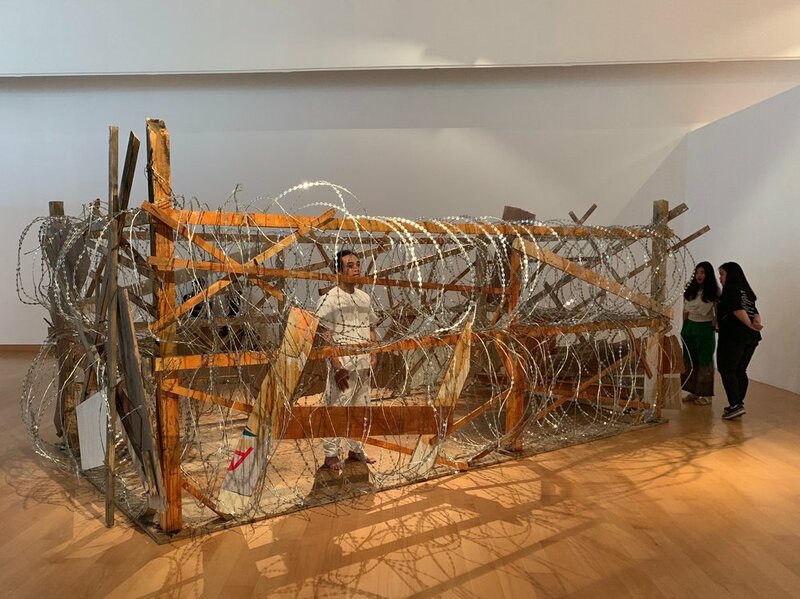 Lin Htet stands in stillness in his barbed wire cage. The artist is protesting. And in fact, there is no end to this as he continues to perform with or without the public (he is there on Mondays, when the museum is closed). The public are forced to engage with the pain, and the horrors in a breach of human rights in contemporary life. In the course of a week, the emotion of lament filled the room red. 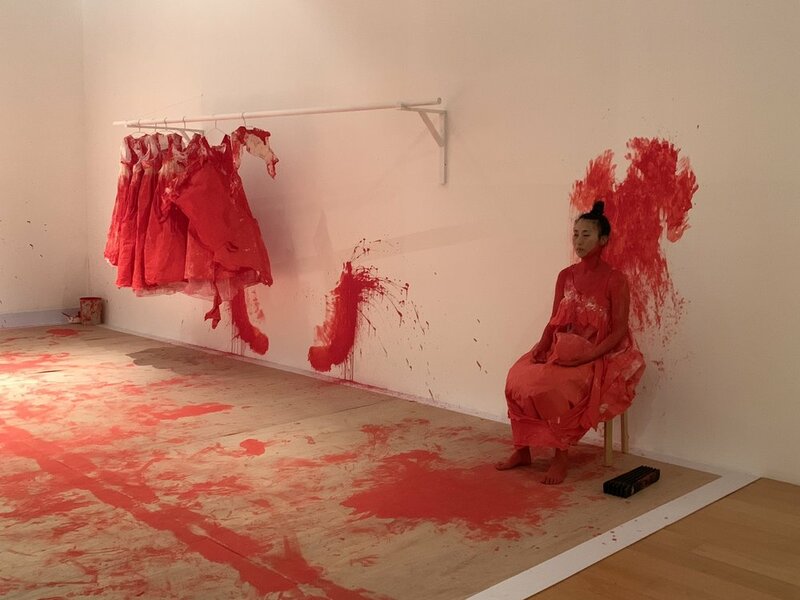 Jihyun enters each day with a white dress hand sewn with traditional Korean fabrics and with the bucket of red paint takes on a mourning process. She covers herself in a solid red. She uses a mask to present the days past, and within a few days she fully remove it, revealing her face. 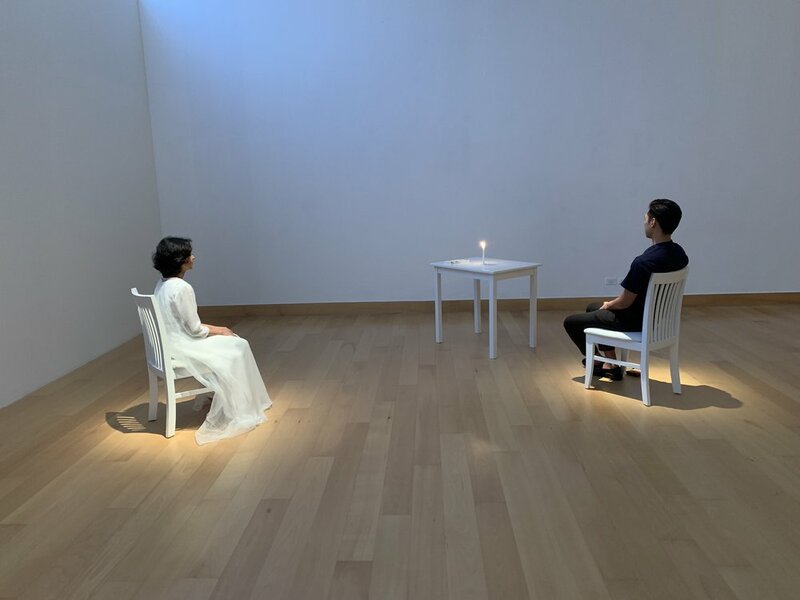 Reetu Sattar replicates the turning of time, and in this first week provokes with a rhetorical question, “how are you doing, today?” Visitors might question how they are physically doing in Bangkok, or as she suggests in Buenos Aires, and Washington DC, sites of government organized crimes. << A POSSIBLE ISLAND ?